And the Tar Heels still lost by eight, and trailed for the last 36:45 of the game. Joel Berry II had 17 in the January loss, but he needed 17 shots to get them. He had 17 Saturday night in the ACC Tournament Championship, and only needed 12 shots. Kenny Williams had similar nights – 11 points on 4-of-9 shooting in January, 12 points on 5-of-8 shooting Saturday night. Obviously a more efficient night on Saturday night. The one thing Carolina didn’t do as well from game one to game two was on the offensive glass. UNC had 19 offensive boards in the January loss, rebounding 48.7 percent of its misses. Saturday night, just eight, for 25.8 percent. But, get this: back in January, for the many more offensive rebounds the Heels gathered, it translated into a 12-7 advantage in second-chance points. Saturday, with so many fewer offensive rebounds, Carolina still had a 12-6 edge in second-chance points. On Jan. 6, UNC had 19 turnovers on its 60 possessions, and Virginia turned those TOs into a 25-3 advantage in points off turnovers. On Saturday night, it was just nine turnovers on 61 possessions, and a modest 10-3 edge for UVA in points off turnovers. Virginia wasn’t as good defensively, allowing Carolina to shoot 40.8 percent overall, the aforementioned 40 percent from three, and permitting the Tar Heels to score 1.05 points per possession. Back in January, it was 29.6 percent shooting from the floor, 34.8 percent from three, and .817 points per possession. Again, Virginia won both games. Boring ol’ Virginia, somehow winning with what it does on the offensive end. OK, so UVA only shot 42 percent from the field, but it was 9-of-17 from three, and 20-of-22 from the free-throw line. That’s how you end up scoring 1.164 points per possession, against a UNC team ranking 34th nationally in defensive efficiency, according to KenPom.com, allowing .968 points per possession on the season. Don’t turn it over, hit your threes, get to the line and convert. To win a championship, you need to be able to win different kinds of games. 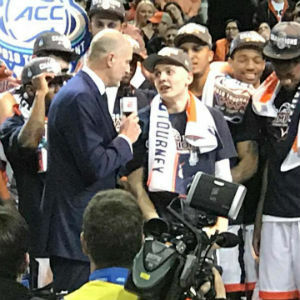 Virginia just beat a really, really good North Carolina team for the second time this season, and the two ways it won those games couldn’t be more different.